Groovy Girl read all these picture books the first two days we had the bag home from the library. Me, well, it has taken me over two weeks to read all of them and I had to renew them once in order to write about a few of them. 1. 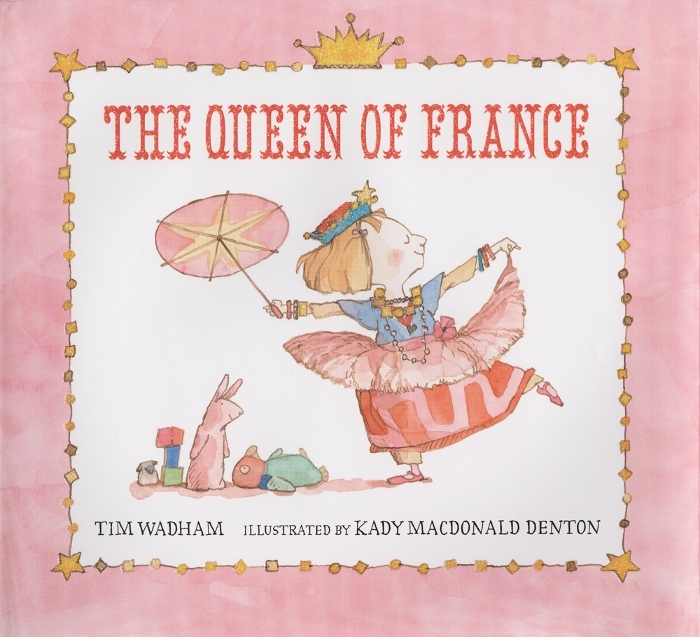 The Queen of France by Tim Wadham, ill. by Kady Macdonald Denton (2011); Rose wakes up and "feels royal" so she plays dress up and goes to look for her mother dressed regally. Using her imagination her parents play along as Rose changes from the queen to Rose and back again. A seemingly simple tale of love and acceptance, Rose demonstrates one can be a girl with many sides. Denton draws Rose with a Ramona-like haircut in amazing watercolor illustrations. Click here for an interview with Tim Wadham. Hooray for first time author Wadham, a fellow librarian, with this picture book. 2. 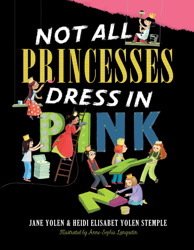 Not All Princesses Dress In Pink by the mother/daughter writers Jane Yolen & Heidi E.Y. Stemple; ill. by Anne-Sophie Languestin (2010); Similar message in this one with quirky digital illustrations. Each page shares how princesses can play soccer, baseball, wrestle with a dog, dance in the rain, break their nails while planting a garden of pumpkins (of course), and my favorite, escape a stony tower using all their cool girl power, using a ladder like monkey bars. I like Denton's illustrations better but the message of this one is equally strong: whatever you choose to be you can still wear your sparkly crown! Happy Sunday and wear your crown with pride! Weekend Cooking; Road Trip to peace.